It’s been 30 years since TEVA first created their sandals which are suitable for wearing to water and land sports. What has once been regarded as the best design sadly depleted over the years, as numerous other summer-friendly shoe models were released; but what comes around goes around, and the trend of sandals is back once again! A brand that has always been changing, with a strong idea on the styling concept of mix-and-match is celebrating their SS15 series with the motto: “Be Original, Be Yourself”. By matching their sandals with our everyday looks and achieving the sporty chic appearance with their ‘socks and sandal’ concept, they have created a series of very interesting images of their latest collection for both men and women. 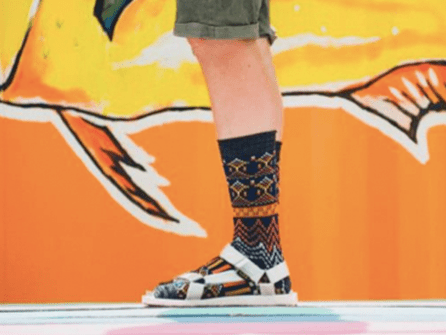 With their Original Universal and Original Sandal matched with full printed socks for an urban outdoor appearance, their sandals are also reinterpreted with a two tone design where the sole and the bottom are in two different colors, bringing on a fresh new contrast to summer. There is also the Original Universal in Leather Metallic with an updated shinny appearance giving off a more feminine and semi-formal look. On top of that, a whole bunch of collaborations done with Oshamn’s, Heather Grey Wall, White Mountaineering and Opening Ceremony have also been released. For more details on their products, visit the link above.